The past elections were simply 'A Nightmare' for the Congress. With merely 21 seats in the 200-seat Assembly Elections in 2014, the Indian National Congress has been seen working extremely hard for reaching the half-way mark. A strong and unified regional leadership, a defined role for party President Rahul Gandhi and careful selection of issues to be addressed shall be important for Congress to regain the state of Rajasthan in 2019. The Congress has been working consistently not just on winning the bigger elections but also the smaller elections - Mandis, Panchayats or Corporations. The cooperative sector, agricultural banks for these set the tone and tenor of how the political landscape will evolve. Sachin Pilot, the party’s State President of Congress, and the top contender of the party for being the Congress Chief Ministerial candidate had been trying to channelize the failure of the government and the protests that should have been controlled that lead tp Agrarian Discontent. Furthermore, Ashok Gehlot, the former Chief Minister of Rajasthan has also been speculated to be in the running for the party’s nomination for the top post. 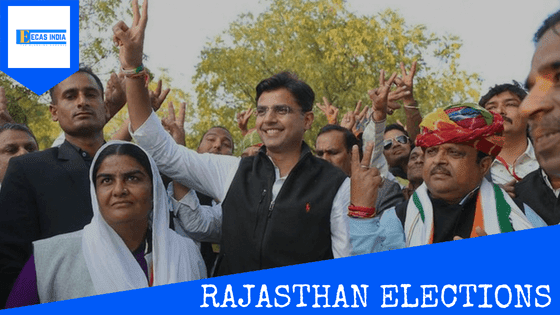 Although there seems to competition for leading the party in the Assembly elections, recent reports suggest that a compromise has been reached and that Sachin Pilot is all set to assume the lead role and shall also be announced as the Chief Ministerial candidate in the near future. Earlier, since the Crop Failure, the people thought that the State Government would intervene, pass a loan waiver, provide required financial help. People had the faith that ‘if we are in trouble, the government will save our lives’. Because there is a disconnect between the ruling dispensation in Jaipur and the farming community, we have come to this. Ten lakh farmers are waiting for compensation from last year’s crop damage caused by hailstorms. This is as per the official records, and this has been stated by the Minister in the Assembly. Since Rahul Gandhi’s elevation as party President, he has assumed a larger role in attacking the Union Government and its policies. The set of elections in late 2019 shall be his last test as they further take place into the Grand Finale of the General Elections 2019 which would consolidate the anger against government policies into fruitful results for the party. So one thing to say here "WIN IS MUST". Please follow for more on this! Do let us know if there are any glitches! Happy to help !